25 years old and still going strong: Amorphis are one of the most successful bands in Finland, they also landed their latest album “Under the Red Cloud” on No. 2 in the German charts. No need to mention the fact that this authorized biography (written by Markus Laakso) is a MUST for (German-speaking) fans of the band anyway. And everybody else who enjoys the tougher sounds from the Land of a Thousand Lakes can hardly get past this work too. 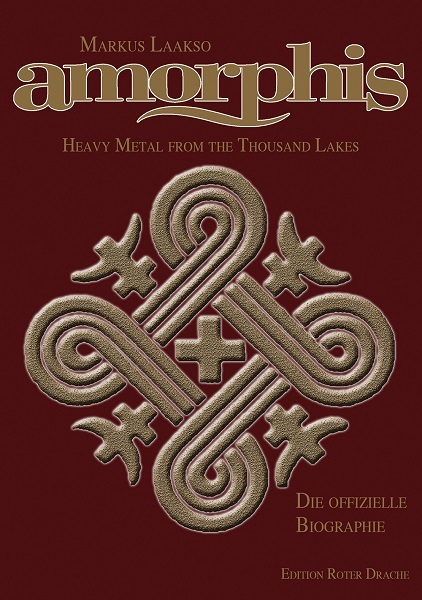 Simply because Amorphis is an essential part of this wave of Finnish metal bands that broke the domestic boundaries and have been among the big names in the scene for decades. In each chapter you will find some well-known names from the music scene – not only the Finnish scene – and will learn a lot about (Metal) music history as well as history as such. Apart from the informative aspect, there is a fundamental reason to purchase this book: it is simply well written and absolutely entertaining (plus well translated from the Finnish original). Not only because of hilarious childhood photos and even more hilarious stories about … ummm…. “wine, women and song” … as soon as you start reading, you are hooked. One of the reasons could be that biographer Markus Laakso is not only an accomplished author, but himself a Metal musician (e.g. Kuolemanlaakso, Chaosweaver) and last but not least a fan of the band. He has worked thoroughly and spared no effort to interview current and former band members, their families, friends and colleagues. Which he did carefully and sensitively as well, so that you almost get the feeling to be there yourself, in the (sanitary-wise slightly insufficient) rehearsal room, in the studio, at a video shooting or in the (way too tiny) tour bus. He found many anecdotes to describe how Amorphis was born and how the band gradually focus on the Finnish Kalevala for inspiration. How the naive young musicians signed their first major record deals, and later regret their naiveté when it even comes to a trial. How long and arduous the path to success can be for a band, how many fortunate circumstances and medium to total disasters seem unavoidable – Laakso did wonderful work here. Moreover, it has also dug deep into the photo library: more than 170 snapshots illustrate these 432 pages of excellent research. Summing up, this book is about friendship and the love of music – which despite all the obstacles and conflicts should still be the most important.